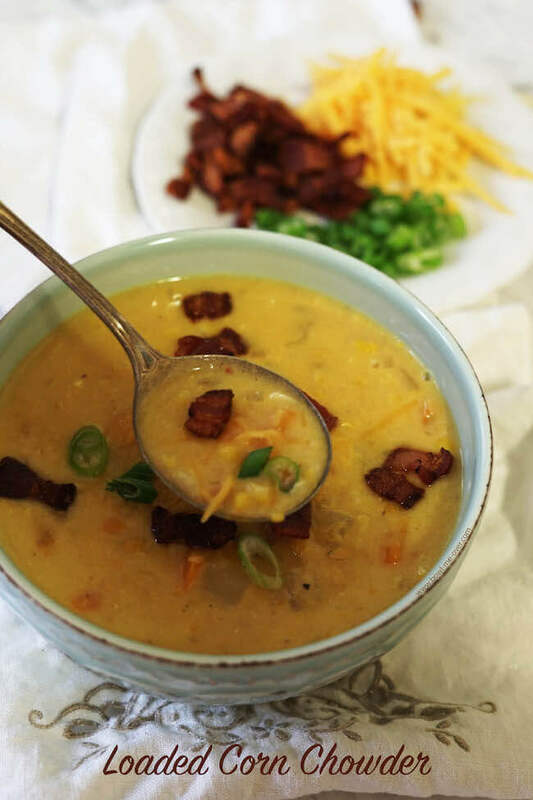 Today my friend Debra Clark from Bowl Me Over is sharing this delicious Loaded Corn Chowder recipe with us! Doesn’t it look like the perfect winter recipe? 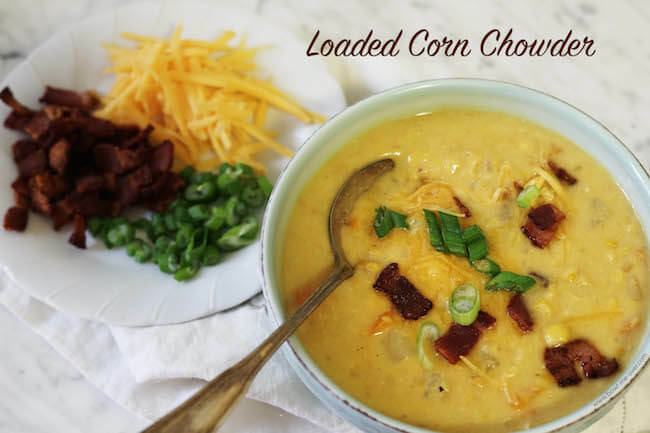 Loaded Corn Chowder tastes like a big hug from your favorite Aunt! An old-fashioned chowder full of crunchy sweet corn, creamy potatoes and delicious cheese it will warm you to your toes on a cold winters day. It’s an easy meal that comes together in about 30 minutes and you just might trick your kids into eating their vegetables! An old-fashioned chowder full of crunchy sweet corn, creamy potatoes and delicious cheese! Thank you so much for the opportunity to share a recipe with your audience Jamie! I met Jamie a couple of years ago at a food conference in Utah. Though we had never spoken before we shared a ride from the Salt Lake City airport to the conference and from then on became fast friends! Since you follow her blog, then I’m sure you know how special she is also and today I’m honored to share one of my favorite recipes with her audience. Loaded Corn Chowder! My recipe for corn chowder is super creamy – I use sour cream for tang and cream cheese to get that luscious creamy texture! 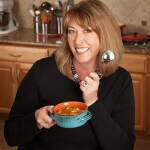 My name is Deb and I blog at Bowl Me Over. On my blog I share delicious recipes that often end up in a bowl – hence the name Bowl Me Over! 😀 Meals aren’t always soups or stews, I also share great salads, desserts vegetables and side dishes. I pride myself in sharing tried and true side dishes, many that have been passed down from generation to generation. Think updated comfort food with my special twist! Most of my meals are quick and easy meals – enjoyed by busy families! Ok – let’s talk about this chowder! If you like clam chowder, you’re going to love this stew. If you like clam chowder, you’re going to love this stew. My recipe for corn chowder is super creamy – I use sour cream for tang and cream cheese to get that luscious creamy texture. 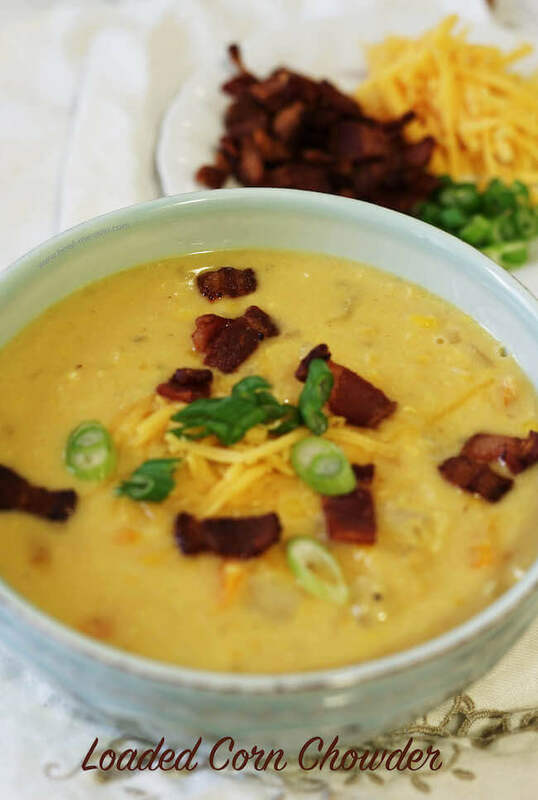 Topped with more cheese, salty bacon and onions this is one delicious bowl of soup! Clam Chowder not your thing? You’re still going to love this stew! In addition to the luscious creamy texture and tang the sweet corn stays crunchy. It’s just delicious! If you are lucky enough to have leftovers, it tastes even better on day two and day three. Leftovers even taste better on day two or three! What do you think? You ready to give this chowder a try? I hope so! Why don’t you check, I bet you have everything you need in your pantry, fridge and freezer. Let’s get cooking! Loaded Corn Chowder is an old-fashioned chowder full of crunchy sweet corn, creamy potatoes and delicious cheese. It will warm you to your toes on a cold winters day. It's an easy meal that comes together in just over 30 minutes and you just might trick your kids into eating their vegetables! Remove the bacon from the pot and place it on paper towels to drain. Pour the excess bacon from the pan, being sure to keep all the brown bits on the bottom of the pan - that's great flavor! While the bacon is cooking peel and dice the onion. Dice the bell pepper. Peel and dice the potato into a small 1/2 dice. Mince the onion. Add the olive oil to the stock pot and add the onion, bell pepper and potatoes. Season with salt, pepper and red pepper flakes. Sauté for 3-4 minutes until the vegetables begin to soften. Add the garlic and saute for another 30 seconds, just until it's fragrant. Add the chicken stock, frozen corn and cream style corn. Scrape all of the brown bits from the bottom of the pan. Increase the heat to high and bring to a boil. Stir occasionally and boil until the potatoes are tender. Serve topped with additional shredded cheese, thinly sliced green onion and reserved bacon. Enjoy! *Starting the bacon in a cold pot and slowly cooking the fat off will leave your bacon super crispy. It usually takes about 10 minutes, but it's better than trying to fry it really fast. In addition you can use the pan drippings to sauté the vegetables will give them even more flavor! 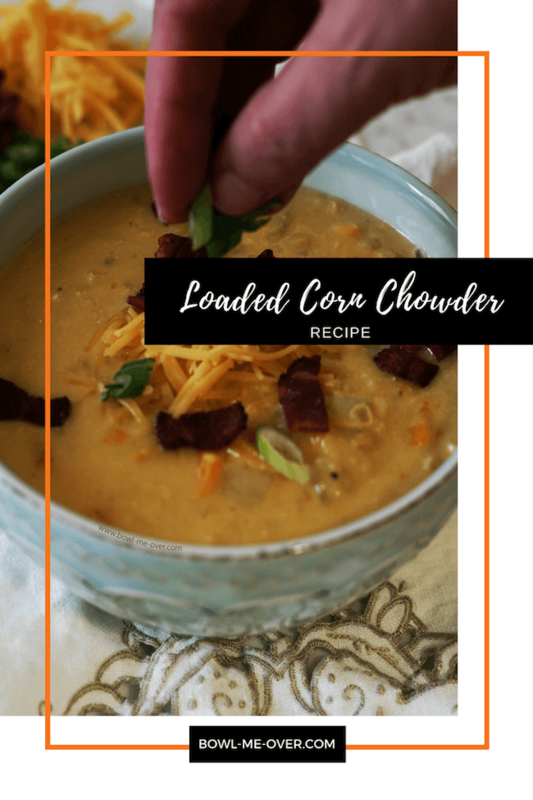 Thank you again for sharing my for Loaded Corn Chowder. If you enjoy this recipes, I would love you to join me on the blog! Thank you so much for sharing this recipe with your readers, I hope they really enjoy it! My hubby said it is hands-down his new favorite (gotta love that!) 😀 I hope you love it as much as we do!